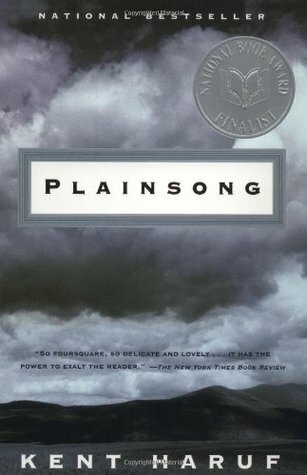 Planinsong is a story about ordinary people in a small town in eastern Colorado doing ordinary things. Although the book is about ordinary people doing ordinary things, I found it hard to put the book down when reading it and although the story plot sounds complicated and tracks two young brothers, ages nine and ten, the boy’s father, a girl seventeen years old and pregnant, and two bachelor farmer brothers, the action filled story moves quickly and is easy to follow. The two boys are doing boy things while in the process of losing their mother to mental illness while the father, a teacher, takes on the added responsibility of an only parent. Meanwhile the story of the pregnant teenager follows a separate but parallel path that engages the boy’s father coworker at school and the two bachelor farmers. Eventually the stories merge in an uplifting and emotional climax. The author knows his subject, region and people and is able to describe them skillfully in a way that reveals this in a way that seems natural and authentic. From my perspective, a five star read.